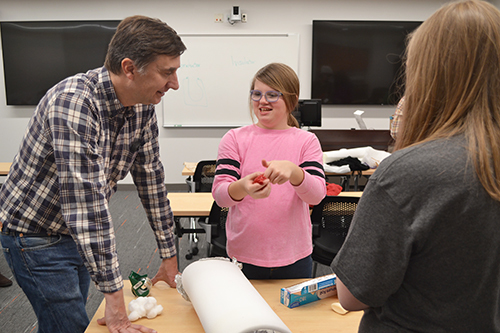 Joe Muskin chats with Cornerstone Christian Homeschoolers about their incubator design. 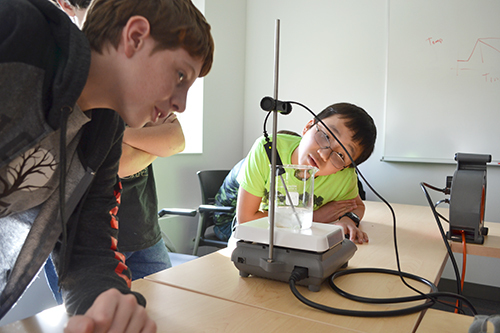 Cornerstone Christian Homeschoolers test a number of chemical reactions to determine which will work best for their incubator. Because many parents in these third-world countries either can’t afford to pay for a hospital visit or can’t physically get to a hospital, the idea behind the curriculum is for students to design an inexpensive incubator that can regulate a baby’s body temperature without the use of electricity, which sometimes doesn’t exist in more remote locationis, or solar heat, which would be very expensive. “So what these students are doing is trying to come up with a real solution to this problem,” Muskin explains. The idea is to use chemical reactions that produce a certain level of heat that can be sustained for a long period of time. So through the curriculum, the students have been exploring a number of different chemical reactions. 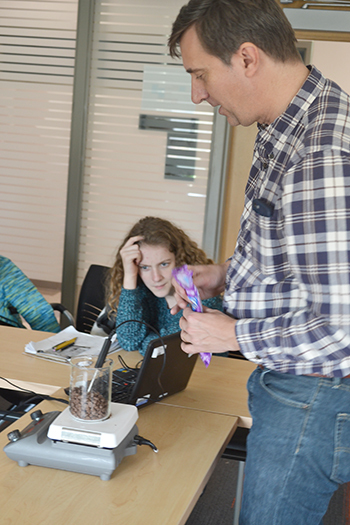 Joe Muskin and students watch as chocolate changes from a solid to a liquid, measuring the temperature changes over time. Once the experiment was done, they got to eact the fondue. 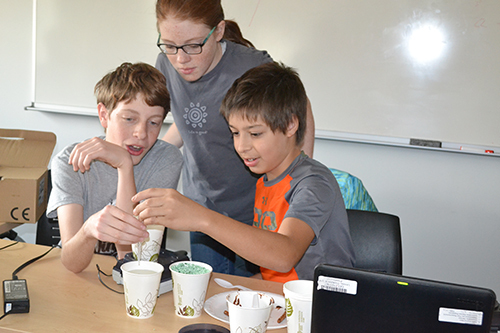 Using inquiry-based learning techniques, Muskin reports that the students themselves have been “kind of driving that learning,” and, through exploration, have come up with a number of scientific principles on their own. Students enjoy the fondue once the chocolate experiment is done. 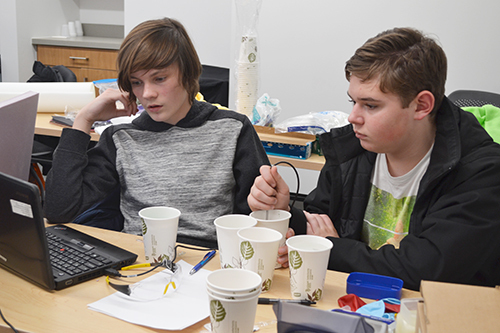 In the context of designing and building their incubator, one of the problems the students ran into was that chemical reactions produce a lot of heat very suddenly, and then cool off really quickly. However, for an incubator to work properly, the heat needs to be long-term, and to somehow be captured. To solve this issue, students needed to learn about another scientific principle: phase change. The idea was to try to make the heat more long term by using phase change materials, and thinking about what's going on when something is changing phase. Before building their incubators, they also needed to address the difference between a conductor and an insulator. So they studied things that conduct vs. things that insulate, not just heat, but electricity, and what's actually going on in these materials. A student watches as ice melts much more slowly on the insulator material on the right. 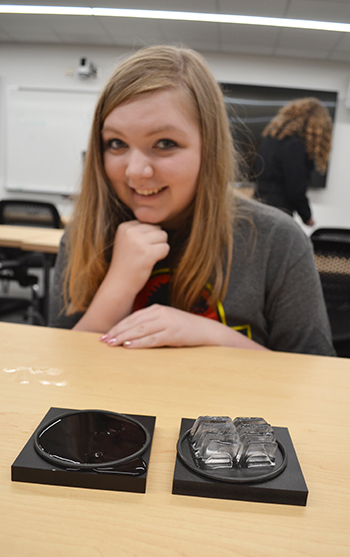 One experiment they did involved placing ice cubes on two different surfaces, one a conductor, and one an insulator. In the image to the right, the surface on the right was the insulator, and the ice melted much more slowly. 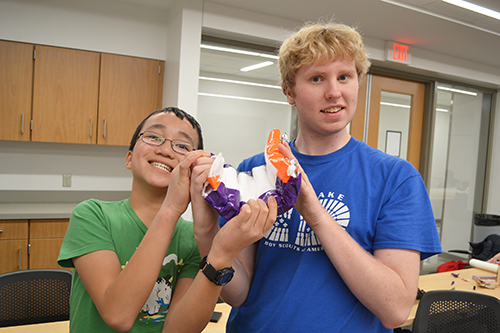 Two students show off part of their incubator prototype. Regarding potential discoveries she and her teammates had made, she explains, “We have some things that went around the temperature of what we need, which is good.” Their secret formula? Boyer and her team settled on a chemical reaction comprised of 17 grams of water, 17 grams of road salt, and 30 grams of Vaseline gel. A student shows the data they recorded from their test chemical reaction, which quickly reached a peak, then maintained that temperature over a long period of time. Like Boyer, 9th grader Matthew Lugardo reports that he also finds actually creating an incubator that might make a difference for people to be quite rewarding. “If we do make an improvement, this will be able to impact lives.” He adds that he finds this aspect really exciting, adding that last year Cornerstone did POETS’ solar car curriculum. “Being green is great,” he acknowledges, “but it's also really exciting to be able to do that [make a difference in peoples’ lives]. 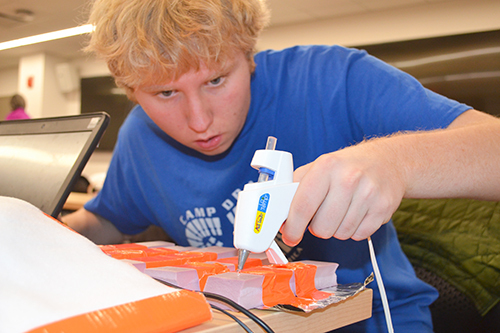 A student making his incubator prototype. Two Cornerstone Christian Homeschoolers testing different chemical reactions watch the temperature trajectory of each on a computer. Muskin comments on his work with groups like Cornerstone: “I think it's really important to reach all students. I think home school students are a group that tends to be overlooked.” Muskin adds that the teachers who are helping to develop the curriculum are actually testing the unit out in a school that’s in a rural area as well. 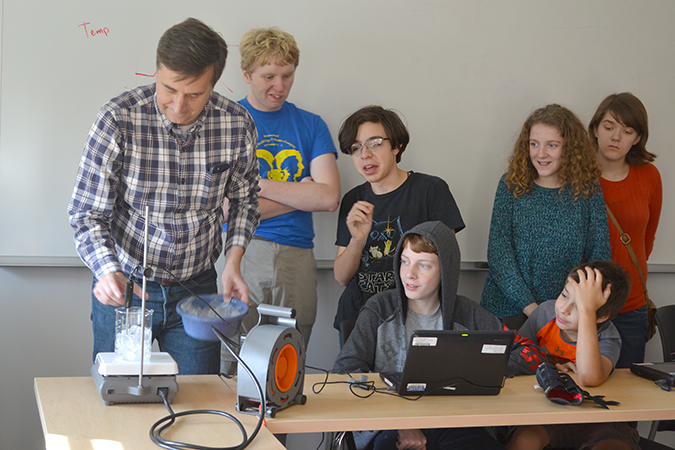 Joe Muskin sets up an experiment for the students, who are measuring the data for how long it takes water to change states from ice (a solid), to a liquid, then to a gas.